Having a website can impact the success of your business as a realtor. There is a lot of flexibility with customization that can allow you to get creative, which in return can help attract new visitors. A healthy-looking website can narrow down the competition that can overwhelm a potential buyer. A website that is updated can lead to higher conversions at a much faster rate. As a realtor, you should differentiate yourself apart from other agents who are competing with you by having a custom branded website. Including an IDX (Internet Data Exchange) feature to your website, can enable Realtors who use the MLS (Multiple Listing Service) database, to integrate outside of their agency website and showcase it onto the Realtors personal branded one. This allows future visitors from leaving your website and moving on the next agent. Content is another reason why having a website is important. 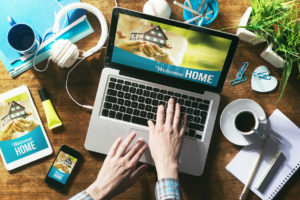 Not only are you communicating about your brand or service as Realtor, but you’re also helping your website get noticed. Organic SEO (Search Engine Optimization) can help bring further awareness into search engines like Google. One way to include content on your website is by blogging. Blogs can be used to match inquires of people who are searching for similar Real Estate information on the internet. This can also help bring more engagement and popularity to your blog and other pages on your website. Are you still not convinced that having a personal Real Estate website is important? Did you know 82% of marketing and digital professionals say their organization increased when investing in websites to differentiate their brand? Having a website(s) can help you achieve organic marketing efforts that can turn them into long-term clients. It will help your brand get more notice and attract new visitors.